PMC-Colinet continuously meets the challenges of productivity and. specialization. Machines bearing the PMC-Colinet trademark are the highest production, longest lived machines on the market today. With plants in Belgium and the USA, PMC-Colinet works closely to meet your needs. Manufacturing, R&D and marketing are performed at both locations and enable us to respond quickly and effectively anywhere in the world. Our Belgian Plant designs and delivers rotating product type machines. These CNC machines use non-rotating tools to accurately create the geometry and threads on a rotating pipe or coupling. 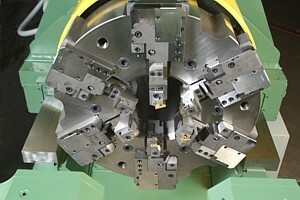 Our USA Plant produces rotating tool machines. These CNC machines use rotating tools to create geometries and thread forms on non-rotating pipe and couplings. Both machine types are equally capable of API, standard and premium connections. However, with their shorter set-up times, our rotating product machines are better suited to production schedules with frequent size changes or smaller runs. The rotating tool machines are designed specifically for high production, high volume product runs. PMC-Colinet personnel have been cross-trained in both technologies. Either plant can produce either technology to best meet our customers’ needs.